The French colonial war in Algeria began in 1954 and lasted until independence was granted in 1962. 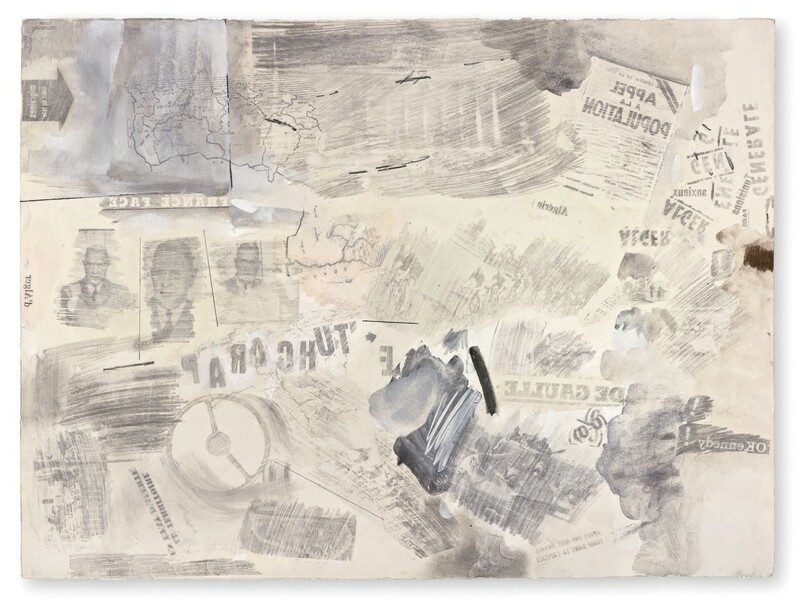 It was a conflict that Rauschenberg likely heard more about during his visits to Paris in late April to May, and June 1961, where he made Untitled (de Gaulle). The French president’s face indeed appears three times, at centre left, and his name once. De Gaulle’s rise to the presidency was directly tied to the war. In May 1958 a military junta in Algiers demanded the appointment of de Gaulle as premier, which occurred on 1st June, and in January 1959 he became the first president of the Fifth Republic. Formal negotiations for Algerian independence began on 20th May 1961, but broke down and were suspended on 13th June. 1 During that time, after midnight on 5th June, several gun battles broke out in Paris between Algerian Muslims and French police, resulting in eleven Algerians being killed and eight French policemen wounded. Rauschenberg, as a recent visitor to Paris about to return there, undoubtedly took note. In Untitled (de Gaulle) the word ‘Alger’ or ‘Algerie’ is repeated four times, and there are two maps of the country in North Africa, clearly marking this as Rauschenberg’s main focus. There is an image of tanks at the lower centre, near the headline ‘Apres une Nuit Drama-tique dans la capitale’. It is unclear if the capital referred to is Algiers, or Paris, or both. To the lower left, there is a clearer headline ‘Le territoire en etat d’Attente’, more clearly Algeria, along with single suggestive words like ‘anxious’. At the upper right, a sizeable ‘Appel a la Population’ is directed to the citizens of Paris. The words and images taken from French media are an instance of Rauschenberg absorbing his immediate context. As he did not read French, most of the chosen words are simple cognates yet this drawing indicates that he had grasped current events and the state of heightened alert in Paris. As he travelled increasingly in the 1960s, transfer drawing became his preferred mode of continuing to work on the road. As such, this medium also took on a layer of local currentness, and the diaristic. 1 ‘Chronology of Algeria Conflict’, New York Times, 4th February, 1962, p161. The Guggenheim retrospective chronology indicates Rauschenberg was in Paris for events on 20th and 28th June. He also attended his gallery opening there on 27th April, then travelled to Stockholm before returning.